What is the Name of the Father and His Son? Webmaster Note: Ray was not able to give his final approval to this paper before his death on May 23th, 2012. Mystery of mysteries: Is "Jesus" the name of our Lord and Saviour or is Jesus, as many contend, a spurious counterfeit name? And what is the name of our Lord's Father? Surely we should know the correct name for our Saviour. And surely we should know the name of His Father. But don't you know the name Jesus has been almost demonized in recent years by professed Christians. They insist that the name Jesus is not the proper name for our Lord. And the Jehovah's Witnesses and others passionately teach that the Father's Name has actionally been removed dozens of times in the New Testament Greek manuscripts. Is any of this true. Prepare to be shocked by the Scriptural truth of this subject. For nearly a dozen years I have received admonitions from numerous of my readers and detractors instructing me to start using the proper and correct names for Jesus and His Father. They think the translators have substituted the Father's name in the New Testament for something else. And they say the name Jesus is a pagan name derived from the Greek god Zeus-G-zeus. Jehovah Witnesses and countless others claim that the references to God the Father in the New Testament has been changed from "Jehovah" to either "Lord" or "God," so as to deceive the masses regarding this proper name for God. What utter nonsense. Back in the days of the apostles, thousands of copies of their gospels and epistles were sent throughout the Mid-East. And today we still have six to seven thousand copies of those copies. And those letters were duplicated and sent out immediately after they were written. They were distributed to church after church and congregation after congregation and family after family. How many copies were sent through the Roman world only God only knows. Follow this: Thousands of copies of the Apostle's letters were send to thousands of people, families, and church congregations during those early years. And many of those copies of copies have come down to us today. How then, is it even in the realm of possibility that someone or an entire army of people could go out and locate all of those thousands of Greek epistles; then confiscate them; then fraudulently erase 200 references to Jehovah and insert either "God" or "Lord" in their place; and then return them again to their rightful owners? Are they serious? Apparently. But no, it never happened. The Holy Spirit of God did not inspire all of the New Testament writers to use the Hebrew name YHWH transliterated to "Jehovah," hundreds of times in their gospels and epistles. On the other hand, let's ask ourselves a serious question: If Jesus said He came to exalt, honor, and manifest His Father's Name, wouldn't there have to be at least a few examples of Jesus Himself using His Father's Name Jehovah somewhere in the gospels? Surely the Jehovah's Witnesses must have such a copy where the Greek retained the supposed use of the name "Jehovah" in the New Testament. Don't they have such a Greek manuscript from which they made their New World Translation of the Holy Scriptures? Nope, they don't. Where the Greek said "Lord" (Greek: kurios, not YHWH), they changed it to "Jehovah." And where the Greek said "God" (Greek: theos, not YHWH), they translated it to "Jehovah. But that is not translating. That is interpretation. God has not given man the authority to make such changes to His Word (Rev. 22:18-19). The Name "Jehovah" comes from the tetragrammaton which consists of the letters YHWH. These letters when transliterated into the English become "Jehovah." See further explanation below. WHERE ARE ALL THOSE MISSING MANUSCRIPTS? Some argue that the original gospels, for example, where not written in Greek, but in Hebrew, and certainly the Father's Name, YHWH, would HAVE to be in them. But there are no Hebrew gospels written by the apostles. No one has ever found even one. If multiple thousands of Greek manuscripts escaped this theory of the Jehovah Witnesses, where are they? Where are even a few such Greek manuscripts containing the Name Jehovah? Is there a Greek manuscript of the New Testament anywhere on earth that contains the tetragrammaton-YHWH, Jehovah? No there isn't, because there never were any in the first place. But what about statements of Jesus where He manifested and glorified His Father's name, the Name Jehovah? Where did He do this? I'll tell you where - EVERYWHERE! Christians have been standing too close to the trees to see the forest. Oh the Father's name is in there alright, but not because the original writers put the word YHWH/Jehovah in their writings. Aside from David Bauscher who in 2010 made an English translation of the New Testament from the Aramaic of The Peshitta New Testament, and replaced Lord and God in the New Testament to Jehovah, there is no such manuscript. There is not even one Greek manuscript or even one reputable Translation of any Greek New Testament manuscript which contains the name Jehovah in place of the titles, LORD and GOD. But to avoid any lengthy explanation or argument with my detractors, I simply asked them: "What is the proper name that Jesus called His Father?" I told them if they gave me the name Jesus used for His Father, I would repent and start using it myself and in my writings. Well, that was it, I never heard from anyone of them ever again. Funny thing about "holier-than-thou people," they are better at judging and condemning than sound scholarship. I think most of them were probably embarrassed when they checked and found that nowhere in the New Testament did Jesus call His Father by any proper name. What Jesus called His Father was either "Lord," "God" or "Father." Likewise all other New Testament writers referred to the Father only as "Lord," "God," or "Father." I am researching a paper on "Solving the Enigma of God." But as it is somewhere in the future, I decided to cover some of the shorter enigmas that will prepare us for a deeper understanding of just Who our God really is. So this paper is one of those related Biblical Enigmas. While my question to my detractors may have stopped their mouths, it does not solve another problem related to the name of the Father. And that problem is, just where in the gospels did Jesus do the things He stated below? When Jesus says, "I have declared unto them Thy Name..." we can be sure that He did, but where? "Jesus answered them, I told you, and ye believed not: the works that I do in My Father's Name, they bear witness of Me" (John 10:25). "And I have declared unto them Thy Name, and will declare it..." (John 17:26). "Our Father which art in heaven, Hallowed be Thy Name" (Matt. 6:9). "I have manifested Thy Name unto the men which Thou gavest Me." (John 17:6). "While I was with them in the world, I kept them in Thy Name..." (John 17:12). "I am come in My Father's Name, and ye receive Me not: if another shall come in his own name, him ye will receive..." (John 5:43). Question: What is His Father's name? How can Jesus tell us over and over about coming in His Father's Name; declaring His Father's Name; doing all His works in His Father's Name; keeping His disciples in His Father's name; hallowing His Father's name, manifesting His Father's Name; but not tell us what that Name is? Maybe we just missed it. Maybe we are all too close to the trees. Most Christians have no idea that virtually all of the Old Testament references to "God" or "the LORD-YHWH-Jehovah," are not spoken by God the Father, but by someone else. And just who might that someone else be? We'll get to it. But I will give you at least one Old Testament Hebrew Scripture which tells us exactly what the name of God the Father is. In the 2nd Psalm we have reference to two individuals: They are "the LORD" and "His Anointed" and "the LORD and My Son." Psalm 2:2- "The kings of the earth set themselves, and the rulers take counsel together, against the LORD, [Heb: YHWH-Jehovah] and against His Anointed, saying,"
Psalm 2:7-"I will declare the decree: the LORD [Heb: YHWH-Jehovah] hath said unto me, Thou art My Son; this day have I begotten Thee." In these verses we can clearly identify the Father's name as "Jehovah." We have Jehovah and His Anointed; Jehovah and His Son; and again Jehovah and His Son. So in these verses at least, Jehovah HAS to be the Father as He is contrasted with His Anointed and with His Son. And so though Jesus never called His Father by the name "Jehovah," it is clear (from Scripture) that Jehovah is His Father's name. "Being made so much better than the angels, as He has by INHERITANCE obtained a more excellent name than they." (Heb. 1:4). "Wherefore God also has highly exalted Him, and given Him A NAME which is ABOVE EVERY NAME" (Phil. 2:9). Are we told anywhere what that name is? Yes we are, and I am now going to give you a giant clue: Did you noticed that Jesus has already obtained this name in the past tense-has obtained, has exalted, has given. That is past tense, it is DONE! "And now I am no more in the world, but these are in the world, and I come to Thee. Holy Father, keep through Thine Own Name "those whom" Thou hast given Me, that they may be one, as we are." (John 17:11). Do you see it? Did you get it? No? Well neither did I the first few dozen times I read this verse. Sometimes when the translators screw up, they screw up big time. "Father Holy! Keep them in the name of-you to-which you-have given to-me that they may be one according as we" (John 17:11, The Concordant Publishing Concern, The Greek Text). "Father holy, keep them in the name of Thee, by which Thou hast given to me" (John 17:11, The Emphatic Diaglott By Benjamin Wilson). The words "those whom" in John 17:11 above should not be there. Oh it's in the King James, and Strong's Concordance gives us a Greek number for it, however, both words "whom" and "which" can represent the Greek word, "hos he ho." From Strong's: Gk: #3739 hos he ho-"who, which, what, that." It can represent either "whom" or "which," depending on the context. In Verse 5 of this same chapter we read of "the glory which" God had given Jesus. We would never say, "the glory whom" God had given to Jesus. Yet this is the very same word translated "whom" in verse 11 by King James translators. And unfortunately, the King James has blinded millions to this incredible truth. JESUS IS JEHOVAH - For that is His NAME! Holy Father, You have given Me Your Name; now protect them by the power of Your Name so that they will be united just as We are. (New Living Translation - 2007). Holy Father, keep them in Your Name, which You Have given Me, that they may be one, even as we are one. (English Standard Version -2001). Holy Father, keep them in Your Name - that Name which You have given Me, so that they shall be one, just as We are. (Aramaic Bible in Plain English). Holy Father, keep them in Thy Name which Thou hast given Me, that they may be one as We. (Darby Bible Translation. Holy Father, keep them true to Thy Name-the Name which Thou hast given Me to bear-that they may be one, even as We are. (Weymouth New Testament). Holy Father, watch over them on account of Your Own Name which You have given Me, in order that they may be one just as we are. (New World Translation of the Holy Scriptures, Watch Tower Bible & Tract Society of Pennsylvania-THE JEHOVAH'S WITNESSES). Holy Father, protect them by the power of Your Name-the Name You gave to Me - so that they may be one as We are one. (Holy Bible New International Version). "While I was with them in the world, I kept them in Thy Name: those You gave Me I kept..." (Ver. 12). Jesus received (past tense) that Name before His ministry even began. Jesus was not asking His Father to "keep them" through His Own Name as the King James would suggest: (keep through Thine Own Name those whom Thou hast given Me). Verse 12 shows that it was JESUS that was already keeping and had kept them through His Father's Name which He tells us His Father gave to Him back in verse 11. It was "God's NAME" that His Father had given Jesus, so that JESUS could keep those "in Thy Name" whom His Father had given Him in verse 12! "And what is the exceeding greatness of His power to us-ward who believe, according to the working of His mighty power, Which He wrought in Christ, when he raised him from the dead, and set Him at His own right hand in the heavenly places. Far above all principality, and power, and might, and dominion, and EVERY NAME THAT IS NAMED, not only in this world, but also in that which is to come" (Eph. 1:19-21). "But when He says all things are put under Him [Jesus] it is manifest that He [GOD] is excepted..." (I Cor. 15:27). Let me give you one more exciting verse that pulls all these verses together. When was Jesus given this Name? By Whom? And what was that Name? WHEN DID JESUS RECEIVE HIS NAME ABOVE EVERY NAME? "I am come in my Father's name, and ye receive me not: if another shall come in his own name, him ye will receive." (John 5:43). How is it most Christians have apparently never seen this verse before? Seven little words tell it ALL. WHO came? "I [Jesus] am come..."
"She shall bring forth a Son, and you shall call His Name JESUS [Jehovah]" (Matt. 1:21). Whose Name was that: "...My Father's name [Jehovah]..."
The Name that Jesus came with; was born with; taught with; exalted and manifested His Father with; that was above every name, IS THE NAME JESUS, transliterated from His Fathers name JEHOVAH, transliterated from His Hebrew name YHWH. There is absolutely nothing spurious, pagan, corrupt, or counterfeit about the glorious Names: Jesus and Jehovah! Next, notice the words: "You shall call His Name Jesus." God did not leave it up to Joseph and Mary to choose their own name for their Son, they were commanded by an Angel from God the name they were to give Him. It is rare that God dictates the name given to any person. He changed the name of Abram to Abraham (Gen. 18:5). He changed Jacob's name to Israel (Gen. 32:28). But for the most part, God allowed everyone to do their own naming beginning with "And Adam called his wife's name Eve..." (Gen. 3:20). The name that they were to give Him had to reflect all of the virtues of God His Father. God was obviously insistent that His Son's Name be HIS NAME (in Greek), since God had determined that the New Testament Scriptures should be preserved in the Greek language. The name of the Son in Greek had to reflect the same character traits as His Father name does in Hebrew. In fact we have Scriptural proof that the Father exhibits all of the same powerful in both the Old Testament and the New Testament. And so the names Jehovah and Jesus have been transliterated for every language on earth. It is the NAME given to Jesus that must reflect all of the virtues of Jehovah His Father. "For unto us a child is born, unto us a son is given: and the government shall be upon his shoulder: and His Name shall be called Wonderful, Counselor, The mighty God, The everlasting Father, The Prince of Peace" (Isa. 9:6). Did you catch that? It was His "Name" that was to be called Wonderful, etc. Old Testament: Many places in the Old Testament speak of the "wonderful" works and things of God. "Many of LORD my God are Thy wonderful works..." (Psalm 40:5). New Testament: "... the wonderful works of God." (Acts 2:11). "Thy counsels of old are faithfulness and truth" (Isa. 25:1). Isasiah 63:16, 8; ...I John 1:2, II Cor. 11:31 - "God and Father blessed for EVERMORE.," Phil. 4:20 "unto God the Father glory for ever and ever." But is the very use of the letter "J" in error? Isn't it a recent invention? The critics of "Jesus" say His name is from G-zeus, a pagan god. They demonize His name by calling it: His Gentile nickname, spurious, counterfeit, a pseudo substitute, earth pig or swine, man horse, man beast, and anti-messiah. Yet learned experts can show that the very name that the critics of Jesus say should be used, apparently is found nowhere in Scripture. What does the Hebrew Name YHWH (Yahweh/Jehovah) mean? And what does the Greek Name Iesous transliterated to Jesus means? They are the SAME NAME. "A translation conveys meaning, so Yeshua and Iesous mean the exact same thing. Jesus is not a translation, it's a modernized Latin transLITERation of Iesous. A transliteration is simply a letter-for-letter switch: the letters in one language are swapped for letters in another language that make the same sounds. Jesu is a Latin word that sounds like the Greek Iesous. Jesus does not mean "Yahweh saves" or "the Lord saves" or even "He saves". Despite the fact that Jesus Himself means a great deal to many people, there's no English meaning to Jesus at all. The name Jesus is merely the English pronounciation of Joshua/Iesous which means "Jehovah is Salvation." IESOUS was the word chosen by the writers of the Greek New Testament to represent both the Hebrew Old Testament Joshua and the English New Testament Jesus. In an effort to determine the truth I personally [Richard Rives] made a trip to Greece to study inscriptions and to talk with experts concerning the name Zeus. The conclusion of my investigation is that there is no association with the name Zeus and that of Jesus. 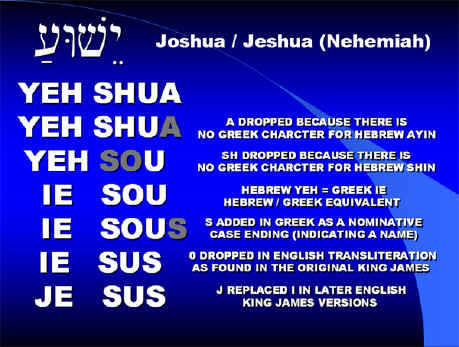 My comment: Below is a wonderful chart showing the simple progression from the Hebrew letters for Yehshua (Joshua) to the Greek transliteration Iesous (Jesus) to the English Jesus. And nowhere in this progression do we find any remnant of the name Zeus! The English Name Jesus is an excellent transliteration of the Hebrew name Yeshua which means YAH is SALVATION By: Richard Rives, http://www.toolong.com/pages/events.htm Author of: "TOO LONG IN THE SUN"
Transliterating a name from one language to another is NOT changing the name. It is the SAME name, but spelled and pronounced to suit the language into which it is being translated. Now how hard is that? Yet wanna-be scholars would have us think that this is utter corruption, fabrication, counterfeiting, and blasphemous. Their criticism of transliteration is unfounded. If that were true, then it would be counterfeiting and corruption to translate anything into ANY language. Here is how simple this is: The English spelling of Yeshua is "Joshua." However, when translated from Hebrew into the Greek language, the name Yeshua becomes Iēsous, and the English spelling for Iēsous is "Jesus." If names were only translated from one language to another, it would even be offensive in some cases, silly or awkward in others. For example the name Natalie means "born on Christmas day." So suppose translating that name from one language to another we translated the meaning of the word, rather than the sound of the name. A mother might then say: "This is my daughter Born on Christmas Day." Someone would probably remark: 'Oh how nice, your daughter was born on Christmas day." The mother would have to respond: "No, she was born on September 23, her Name is "born on Christmas day"-that is her NAME." Pretty silly. Natalie is a beautiful name and in translating it from one language to another we would want to transliterate it and retain if possible its beautiful sound. There are two forms of the Tetragrammaton: YHWH and YHVH. So when vowels are inserted we can see two versions: Ya-Ha-WaH or Ya-Ho-VaH. There is no Y in Paleo Hebrew, only the letter "I." And Pastor Reckart says the rule of grammar is that when the "I" is followed by a vowel it takes on the "J" sound of the I (the "I" can represent three distinct sounds). So in pronouncing YaHoVaH it would be JaHoVaH-Jehovah! You can find thousands and thousands of pages of material written to discredit the name "Jesus" and "Jehovah," yet it takes only a few paragraphs of real scholarship to send all their historical fabrications to the scrap pile. Can you begin to realize how impossible it would be for the Chinese people who speak no Hebrew, Greek, or English to grasp the Name of their Saviour if it were not first transliterated into their own language? Let's stop trying to find demons where they don't exist. Carried to his logical conclusion, anyone believing and trusting in the Name of Jesus Christ will NOT be saved. Now that really is heresy. THE UNIVERSAL JEWISH ENCYCLOPEDIA says: "JEHOVAH is an erroneous pronunciation of the Tetragrammaton a four lettered name of God, made up of the Hebrew letters Yod He Vav He. The word "JEHOVAH" therefore is a misreading for which there is no warrant and which makes no sense in Hebrew" The Hebrew letters point to a Yod Y the more correct pronunciation is Yahweh or some form deriving from the same consonants. For example Yah is used in its shorter form in Ex.15:2 and 17:15, Isa.12:2 and Ps.118:14. It states: "JEHOVAH is an erroneous pronunciation of the Tetragrammaton..." Well, yes, of course it is. But they are setting up a fraudulent straw man. Any thinking person knows that "Jehovah" is not the pronunciation of YHWH. But guess what? That is WHY WE TRANSLATE Tetragrammaton to our language! Give me a break. But "Jehovah" IS how one pronounces YHWH after it has been translated and transliterated INTO ENGLISH! OF COURSE "Jehovah" makes no sense in Hebrew - neither does the name "Universal Jewish Encyclopedia" make any sense in Hebrew! That's an ENGLISH TITLE, NOT HEBREW! Am I going too fast for anyone? Therefore using such words as "misleading," "no warrant," "makes no sense," and "erroneous" are highly defamatory words designed to prejudice us non-academics against both the right and proper spelling and the right and proper pronunciation of the Tetragramma / YHWH in English! So "Jehovah" is an erroneous "form" of the name of the God of Israel, which of course we know is the Tetragrammaon - YHWH. Alright. There's a reason why I underlined the word "form." Here is the primary definition of "form"-shape, structure, and appearance. Does then the letters "Jehovah" have the shape of YHWH? No. Do the letters "Jehovah" have the same structure as YHWH? No. Do the letters Jehovah have the same appearance as the letters YHWH? No. Well, I guess then the Encyclopedia Americana is correct. Except for one little thing: No scholar that I know has ever contended that the letters J-E-H-O-V-A-H have the same shape, structure, and appearance as the letters Y-H-W-H.
Come on Ray, you aren't going to take on the one and only "Encyclopedia Britannica, are you? Well... let me give it a shot: Just maybe they are inserting what they think to be proper vowels into the Tetragrammaton, seeing it is not possible to pronounce four CONSONENTS in a row without using any "vowel" sounds. And if it's an "error" to insert vowels, just how pray tell do the Jews pronounce it without vowels? And vowels are vowels, it doesn't matter where they come from (there are, after all, only five to choose from). Another critic: JEHOVAH -"is an erroneous form of the divine name of the covenant God of Israel." (THE NEW SCHAFF-HERZOG ENCYCLOPEDIA) Here we go with "form" again. The English word "Jehovah" is not supposed to "look like," have the "appearance" of, "structure or shape" of the ENGLISH LETTERS Y-H-W-H or the HEBREW LETTERS. I'll tell you what the word and letters "Jehovah" are suppose to represent. They represent the ENGLISH pronunciation of a HEBREW word. Now how hard is THAT? No expert on languages would ever suggest that YHWH is correctly pronounced "Jehovah." No one has ever said that, because no one believes such a thing. All of these above statements from supposed reputable publications of higher learning have set up BOGUS straw men statements to prejudice the uninformed into believing that the Divine Names of Jesus and Jehovah are to be shunned like some poisonous snake! They will give account-one day! BUT WHAT ABOUT THE "J"
First of all, there IS the "J" sound in Hebrew, and second, we don't want to know how to pronounce the Tetragrammaton in Hebrew anymore than we want to know how to pronounce ALL words in Hebrew. We want to know how to understand the Hebrew Scriptures in ENGLISH, and the Greek Scriptures in ENGLISH. And it would be nice to be able to pronounce God's name in English. Anyway, we are told that it is wrong to use the letter "J" for any name in either the Old or the New Testaments. And this is so, because we are told there no "J" sound in the Hebrew language, and that this letter was not invented or used untill the 17th century. Early in the 17th century (1611 when the King James Version came out), they had not yet discovered the J, hence Jesus is spelled Iesous in the King James Version. Tis true, that the J was not used as a letter of the alphabet until the 17th century, but is is emphatically not true, that there was no "Ja" sound in the Hebrew language. "To claim the sound of the letter "J" did not exist until the alphabet letter was created from the letter "I" is simply a lie. The sound now attributed to the letter "J" was "one" of three sounds that the letter "I" could stand for. All that happened when the letter "J" was formed was to separate the sound from the ltter "I" and give it, its own alphabet character. Thus, in many words or names where the letter "I" had the "J" sound, the new letter stood in the place where the letter "I" once stood. There was no evil in this and no plot by Gutenburg or anyone else to profane the alphabet, words, or names as they are now spelled using the new letter "J." (From: "Meaning of the Name JESUS" By Pastor G. Reckart http://www.whyapostolic.com/html/jesus.html p.2). You know, there just isn't a whole lot more one needs to know than what Pastor Reckart has stated above. Since the ancient "I" did contain the sound "J" all that was done was to put a little tale on the bottom of the well-established "I" so as to never be confused with one of the other two sounds attributed to the letter "I." And from that all kinds of conspiracy theories have arisen against the letter "J" and against the English pronunciations of the names of Jehovah and Jesus. Pastor Reckart has traced the "J" sound far before the common era. He has located Egyptian writings 2000 BC in which the "J" sound is found. The "I" has three sounds depending how it is used. There were two pronunciations of God's chosen people: Yisrael and Israel, And the third sound of the "I" is a "J" sound as in Jezreel. How absurd to believe that millions of God-fearing believers in our Lord Jesus Christ will not be saved because they didn't pronounce the name of their Saviour in the same way that today's Holier-than-thou Sacred Name Societies demand of their followers. I receive e-mails at least weekly wherein writers come to me in the name of Yaushua and bid me farewell by the title Elohim, thinking that they have performed some words of passage into a higher spiritual realm. This is the same kind of superstitious nonsense practiced by the ancient Egyptians and the modern Free Masons. If Jesus and Jehovah are just different spellings of the very same name, how can Jesus be Jehovah and Jehovah be Jesus? Good question, and I will try to solve that enigma for you in my paper "Solving the Enigma of God." But for now, let's notice a few things that do prove that this is so. Did Jehovah say that He was NEVER gives His glory to another? Yes He did. "The God of Israel, the LORD of hosts...For Mine Own sake, even for Mine Own sake, will I do it: for how should My Name be polluted? and I will NOT give My glory unto another" (Isaiah 48:2 &11). "I am the LORD [YHWH-Jehovah/Jesus]: that is My Name: and My glory will I NOT give unto another, neither My praise to graven images" (Isaiah 42:8). If Jesus is not Jehovah, how do we square these statement of Jehovah in Isaiah with the following statement of Jesus Matthew, Mark, Luke, & John? "For the Son of man shall come IN THE GLORY OF HIS FATHER with His angels; and then He shall reward every man according to his works" (Matt. 16:27). "Whosoever therefore shall be ashamed of Me and of My words in this adulterous and sinful generation; of him also shall the Son of man be ashamed, when HE COMES IN THE GLORY OF HIS FATHER with the holy angels" (Mark 8:38). "For whosoever shall be ashamed of Me and of My words, of him shall the Son of man be ashamed, when HE SHALL COME IN HIS OWN GLORY, AND IN HIS FATHER'S [GLORY], and of the holy angels" (Luke 9:26)..
"And now, O Father, GLORIFY THOU ME WITH THINE OWN SELF [Thine OWN glory] with the glory which I had with thee before the world was" (John 17:5)..
"This sickness is not unto death, but FOR THE GLORY OF GOD, that THE SON of God might be GLORIFIED THEREBY" (John 11:4). God's word does not contradict. When Jehovah gave Jesus His "glory," He did not give it to "another." Jesus is not "another." Jesus IS Jehovah! And... AND, Jehovah IS JESUS. Notice below just Who John prepared a road in the wilderness for. Isaiah says Jehovah, whereas Mark says Jesus. "The voice of one crying in the wilderness, Prepare ye the way of the Lord, make His paths straight" (Mark 1:3). Of Whom is this verse speaking? Who was John to prepare a straight path for? Why for "the Lord," of course. And Who was the Lord but Jesus. "The voice of him that cries i the wilderness, prepare ye the way of the LORD make straight in the desert a highway for our God." The conclusion is inescapable: The LORD GOD of the Old Testament is the Lord Jesus of the New Testament. Someone might ask: 'If Jehovah gave Jesus HIS NAME, why isn't His name also Jehovah?" Jesus' name in Hebrew is Jehovah, and Jehovah's name in Greek is Jesus. When Jehovah gave His Son His name, Jehovah, He did so in the New Testament in the Greek language. We shall now see that the character traits of Jesus and His Father are the same. Jesus represented His Father in the flesh perfectly. Being made flesh and having the same weaknesses of the flesh, Jesus had to constantly pray to HIs Father for the strength and wisdom to always do the right thing, but that is exactly what He did all the days of His life in the flesh. Notice the virtues of Jehovah and compare them to Jesus. THE LORD WILL PROVIDE: This name means: "He provides" - Jehovah is called this in Gen. 22:13-14 where God provided a ram to be sacrificed in place of Abraham's his son. In John 1:29 we are told that Jesus provided Himself as the Lamb of God which takes away the sins of the world. "But my God shall supply your need [provide] according to His riches in glory BY Christ Jesus" (Phil. 4:19). THE LORD SANCTIFIES: God sanctifies His people which means to hallow or make holy. "Speak thou also unto the children of Israel, saying, Verily My sabbaths ye shall keep: for it is a sign between Me and you throughout your generations; that ye may know that I am the LORD that doth sanctify you" (Exodus 31:13). THE LORD OUR BANNER: Moses said that Jehovah was his Banner, a symbol of victory, Ex. 17:15. A banner is a flag or symbol of victory (Isa. 13:2). A banner is a flag or symbol of a military commander, and when flown it signifies VICTORY. We have not just won a battle but we as Jesus are to overcome the world, I John 5:5. "He shall feed His flock like a shepherd: He shall gather the lambs with His arm, and carry them in His bosom, and shall gently lead those that are with young" (Isa. 40:11). Jesus said: "I am the Good Shepherd" the Good Shepherd gives His life for the sheep (John 10:11). Jesus gives His life for all the sheep of the whole world (I John 2:2). "So Gideon built an altar to the Lord there and called it Jehovahshalom ['Shalom' means peace]." (Judges 6:24). One of the prophesied names of Jesus is "The Prince of Peace." "For unto us a child is born, unto us a son is given: and his name shall be called The Prince of Peace" (Isaiah 9:5). And Jesus verifies His power to impart "peace"
"In his days Judah shall be saved, and Israel shall dwell safely: and this is His Name whereby He shall be called, THE LORD OUR RIGHTEOUSNESS" (Jer. 23:6). "And Jesus answering said unto him, Suffer it to be so now: for thus it becometh us to fulfil all righteousness" (Matt. 3:15). "Even the righteousness of God which is by faith of Jesus Christ" (Rom. 3:22). "Because He hath appointed a day, in the which He will judge the world in righteousness by that Man [that man Jesus]" (Acts 17:31). "...I will put none of these diseases upon thee, which I have brought upon the Egyptians: for I am the LORD that heals thee." (Ex. 15:26). "And Jesus went about all Galilee, teaching in their synagogues, and preaching the gospel of the kingdom, and healing all manner of sickness and all manner of disease among the people" (Matt. 4:23). "And the name of the city from that time on shall be the Lord Is There [Heb: 'Jehovah shammah]" (Ezek. 48:35). "And he called the name of the place Massah, and Meribah, because of the chiding of the children of Israel, and because they tempted the LORD, saying, Is the LORD among us, or not?" (Exodis 17:7). Israel wanted to know whether God was with them or not after the terrible ordeal of the Babylonian captivity. God was letting them know through Ezekiel that God were "BE THERE." This is most interesting. Some scholars firmly believe that were Jehovah said His Name was "I Am that I Am," means "coming." The name Jehovah represents the third person singular of the verb Hayah (old form Havah) in its "present" or pictorial tense. This would signify "He is becoming," or "He will come to be." It must be related to the form found at Exodus 3:14, Ehyeh, which can only mean "I am coming to be." (From Alexander Thomson-"Who is Our God" p. 48). And so we have in God's name both the promise of "coming" and "being there." And this is precisely what God has done. God has "come" to mankind. "Therefore the Lord himself shall give you a sign; Behold, a virgin shall conceive, and bear a son, and shall call His name Immanuel [Heb: 'with us is God]" (Isa. 7:14). "Behold, a virgin shall be with child, and shall bring forth a son, and they shall call his name Emmanuel, which being interpreted is, God with us" (Matt. 1:23). And when did God come to be "with us?" "The Word was God... And the Word was made flesh..." God began fulfilling this aspect of His name when He came to us in the Flesh of Jesus Christ. "For in him dwells all the fullness of the Godhead bodily" (Col. 2:9). Is God still "with us?" Is Jesus still "there?" "He which testifies these things said, Surely I COME QUICKLY. A-men. Even so, COME, Lord Jesus." "Behold, the tabernacle of God is with them, and He will dwell with them, and they shall be His people, and God Himself shall be with them, and be their God" (Rev. 21:2).